The A3 Sensor can be used with any Ferro-magnetic Test-Object (e.g. solid shaft, hollow tube, beam) and measures Torque, Bending, and Axial Load forces. This is Plug-and-Play technology: mount the A3 Sensing Module nearest to the Test-Object; switch on electric power; initialise, and measure immediately. The Active-3 technology can be applied to volume applications and is also available as an A3 Sensor Kit for laboratory-use and test applications. 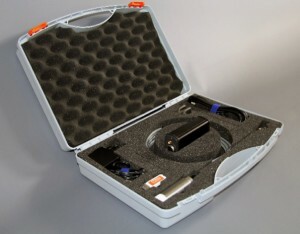 Stored in a protective case, the A3 Torque Sensor Kit contains a fully functional Torque Sensor System (Sensing Module and Sensor Electronics), mounting materials, a mains powered +12 Volt DC supply, a connection cable, USB stick with files, and a detailed user manual. The Sensing Module is supplied for a specific shaft diameter range and should be mounted by the user, facing towards the location from where Torque is measured. The Sensing Module comes in three different sizes to cover all possible applications (from a shaft diameter of 15 mm upwards to a flat surface) the size should be selected by the user when ordering the A3 Sensor Kit. The Sensing Module does not need to touch the Test-Object (drive shaft) and an air gap of up to 3 mm can be managed by this sensor. 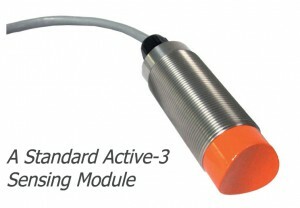 The Sensing Module of the Active-3 Torque Sensor is placed in a 30 mm diameter industrial grade housing and is designed for a specific Test-Object (shaft) diameter. The Sensing Module will be connected to the Sensor Electronics by the attached 2 meter cable. The front-end of the Sensing Module (pointing towards the Test-Object) is curved and is adapted for specific shaft diameters. The Standard A3 Sensing Module (as supplied with the A3 Sensor Kit) can be ordered in three different shaft diameter ranges. The recommended smallest Test-Object (shaft) diameter is 15 mm (SM-Type-1). The Sensing Module for larger shaft diameters (SMType-3) can be applied to any large diameter shafts and to flat surface objects. The Sensor Electronics is placed in its own housing and has three connectors on the front panel: +12 Volt DC power supply, Sensing Module cable, and a mini BNC connector for the analogue output signal (+5 Volt range). On the back panel is a USB connector and one push button for the user to reset the “zero” Torque Value. The A3 Sensor Kit is supplied with a comprehensive user manual. Depending on the Ferro-magnetic shaft material used, and on the applied hardening process, the user of the A3 Sensor Kit has to apply a one-time calibration to the application installed A3 Sensing Module. The calibration values are then stored into the A3 Sensor Electronic on-board non-volatile memory and can be changed again by the user (when used at a different shaft location) at a later time.